With all of the harsh chemicals in products that we really rely on each day, I am always on the lookout for a healthy alternative. I am very careful of what I put onto myself and my family's hair and skin. I was given the opportunity to do a review for Acure and I was sent a lovely item. Calming Body Lotion with Lavender + Lotus Flower. This lotion not only softens, and calms your body but it is also extremely safe for the whole family. 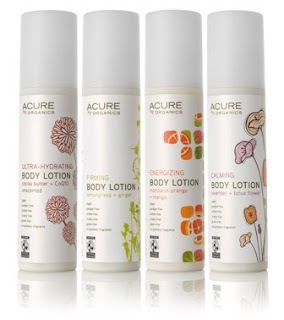 Acure uses only the purest, most effective fair trade, natural and organic ingredients available. They travel the globe to find the highest quality ingredients to formulate their lovely products. Each ingredient is selected with great care to ensure a sustainable and eco-friendly supply chain. Acure offers a full line in products for your face, body, lips and even your hair. The first thing I noticed about the Calming Body Lotion was the scent of Lavender upon opening the body. It isn't overwhelming but very pleasant. The body also offers a very nice artwork that makes the bottle itself a nice addition to you bathroom or bedroom. The body lotion is very creamy and feels silky smooth with a non greasy feel. The lotion does rub into your skin very nice and leaves your skin feeling smooth. I have used this everyday since I have received it. Everyday when I get out of the bath/ or shower I will apply it to my skin. It keeps my skin smooth and very moisturized. I also love how relaxing this lotion is with the scent of Lavender. This Acure Calming Body Lotion is one of my new favorite go to items. About the company: Acure was founded on a simple idea: for each Argan Oil and Oil Control Day Cream they sell, they will donate $1.00 to Bright Pink. They also donate 5% to provide free mammograms to at risk women. You can show some love by liking Acure on Facebook and following them on Twitter. Where to purchase: You are able to make a purchase from the Acure website. You can also go under the tab Store Locations to find a store near you.